Mix together 250 ml of water, 30 ml of rice vinegar and 5 ml of salt. Wash the rice several times until the water runs fairly clear when draining. Let the rice strain for 30 minutes. Transfer the rice to a pot or electric rice cooker and add the measured water. For electric rice cookers, turn on and wait for rice to finish cooking. For stove top cooking heat to boiling , cover tightly and simmer at lowest heat allowing the rice to steam for 18 minutes. Leave the rice to steam and do not lift the lid. Mix the vinegar, sugar and salt together in a small saucepan. Heat the mixture until the sugar dissolves, stirring frequently. Remove from heat and the sushi vinegar cool to room temperature. Take a wooden spatula or spoon and cut and fold the rice. Do not mash the cooked grains. Moisten the bowl with a cloth dampened with the TEZU mixture. The traditional bowl to use is the flat-bottomed wooden sushi oke or hangiri. 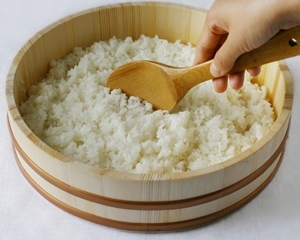 The porous wood absorbs excess moisture and the large surface allows the rice to cool more quickly and evenly. Put the hot rice into the mixing bowl and add 1/4 of the sushi vinegar solution. Mix while fanning the rice with a folding motion so as to not mash the sushi rice. Repeat until all sushi vinegar is used. It is important to fan the hot rice mixture in order to remove excess moisture and create a glossy shine to the rice. Therice should have a slight chewiness and be sticky to the touch.